Background: It is very common in every organization that employee leave entitlement is based on position/grade/Job level. Whenever there is any change in employee data (where the parameter value is changed related to leave quota) then employee leave entitlement should be automatically recalculated in Time Off. In this blog, I will explain how to achieve this functionality using Employee Central Time Off solution. Business Scenario: Let’s assume a business scenario here. Say for example for Organization ABC, employee’s personal leave entitlement is dependent on grade. In the beginning of every year leave entitlement is provided to all the employees based on their current grade. Below is the chart which describes leave entitlement based on grade. Now for employee Mr. Raymond Yaw grade is 2 & he gets 12 Days of personal leave in beginning of year. In 1st July Mr. Raymond is promote to grade 3. As Mr. Raymond is promoted on 1st July his leave entitlement should be automatically changed to 13 from 12, as per the above chart (considering pro-ration). Let’s see how to achieve this functionality using Employee Central Time Off. Step 1: Add a custom field in employee Job Information. Field Type should be custom-double. 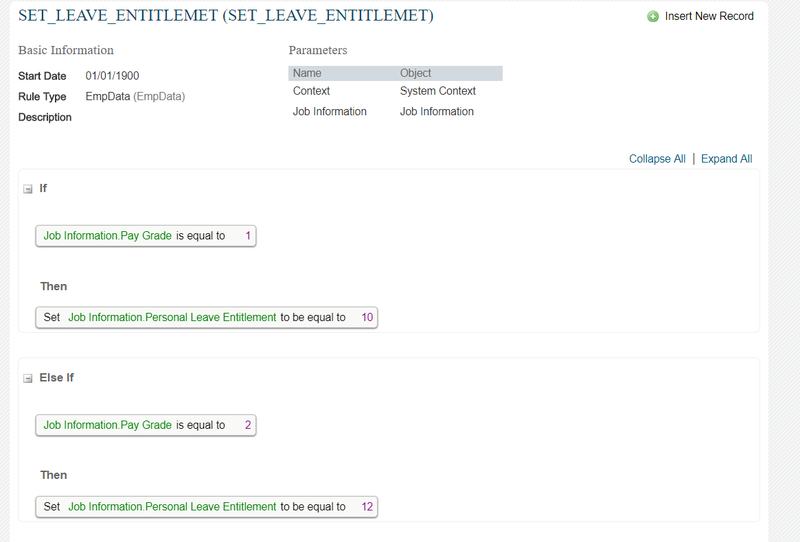 In the below example, we have taken custom-double2 with label as “Personal Leave Entitlement”. You can hide the field in job information based on RBP. Step 2: Create a Business Rule to populate the value for Custom-Double field value. Rule Explanation: In the rule, simply we are setting the value of custom-double2 field based on Grade. If there are many grades you can create some custom look up object & in rule you can use the custom look up object instead of so many IF & ELSE IFs. The rule should be used in “onSave” of Job Information in “Manage Business Configuration”. 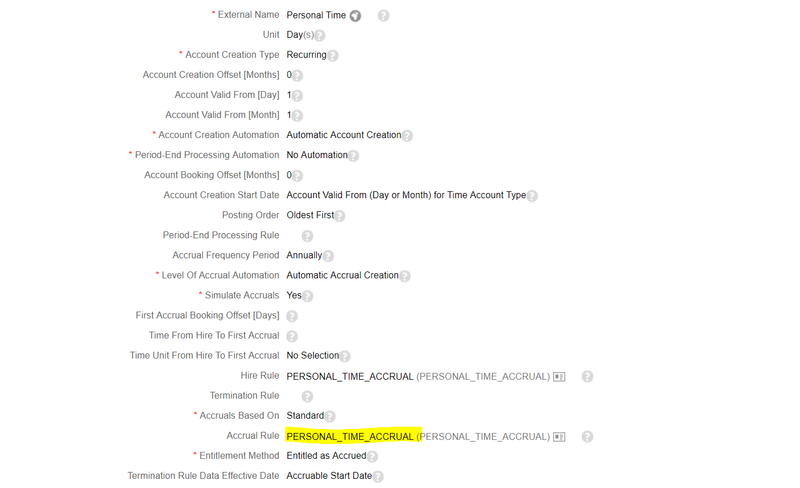 Step 3: Create Time Type & Time Account Type from “Manage Data” option in Admin Center. 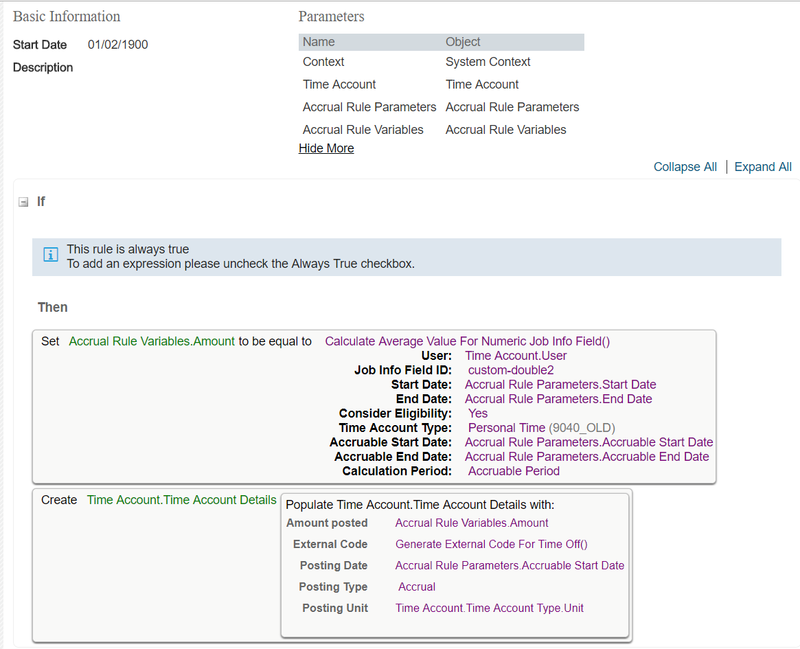 In the Time account type maintain the Recalculation Fields. The recalculation field should be the custom-double field which has been added in employee Job Information. Rule Explanation: In the accrual rule we are using rule function “Calculate Average For Numeric Job Info Field” to calculate the average value of leave entitlement based on the custom-double field which has been added in employee Job Information. All are set from the configuration side. Now let’s see the system behavior. Personal Time Leave Entitlement of Mr. Raymond in the beginning of year is 12. When there is change in the grade automatically recalculation is triggered in Time Off & Personal Leave entitlement is adjusted based on the accrual rule. We have just used a sample accrual rule. We can use the rounding functionality to calculate the rounded amount correctly. With this function of calculating average job info field, its calculating the average only for the newly added event reason period. EX: Employee is having 15 days of leave from 1st Jan,2018 and on 1st July he has been promoted to a higher level where he should be getting 20 days per year. Since this action has been happened only on 1st July,2018 we should recalculate the annual leave. 184 Days is nothing but remaining days from 1st July 2018 to 31st Dec 2018. But the requirement is it should recalculate the annual leave like from 1st Jan to 30 June it should prorate based on 15 Days and from 1st Jul to 31st Dec it should prorate based on 20 Days. I have used the same function in my accrual rule as mentioned above. Kindly let us know do we need to make any further changes.